This word work activity is perfect for stations or centers! 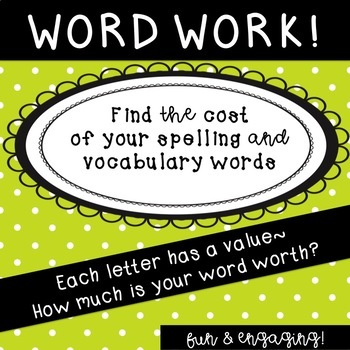 Find the cost of your spelling and vocabulary words! 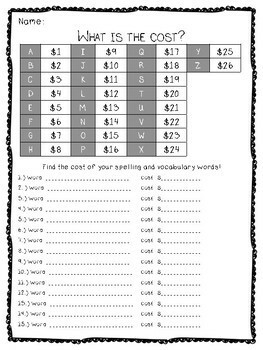 The worksheet includes a dollar amount for each letter in the alphabet! Use with any spelling list, or vocabulary words. 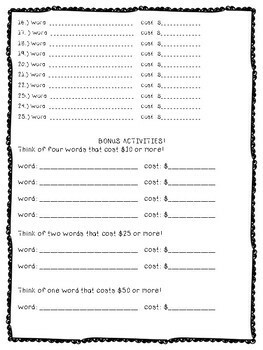 BONUS activity on the worksheets includes students to think of $10, $25, and $50 words! Thank you for your interest in this product! Visit Miss Iced Coffee for more engaging, creative, and fun resources and printables!